A very adaptable canapé recipe, these chicken balls are light and deliciously lemony. Beautiful on their own or great for serving with a selection of dips. Heat 2 tablespoons of the oil in a frying pan over a medium heat and cook the spring onions until they are soft but not brown. Set aside to cool. Once the spring onions are not too hot to touch, and using your hands (gloves optional! ), mix all the ingredients together in a bowl. Mould the mixture into balls (approx. 3cm) and put aside on a plate. Gently warm the rest of the oil on a medium heat in a frying pan (approximately 2 minutes) and then remove from the heat. 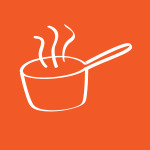 Using a spoon to place the balls into the oil (the process of removing the pan from the heat before putting the balls in avoids splashing) and return to the stove top on a high heat. Cook for 5 minutes each side until the balls are golden.